With MAGGI's wide range of products, ang simpleng dish ay pwede nang magical ang sarap. It has become the key to noticeably great tasting meals and delightful meal experiences. MAGGI is the best way to cook up happiness at home so that everyday mealtime can transform into great family moments. 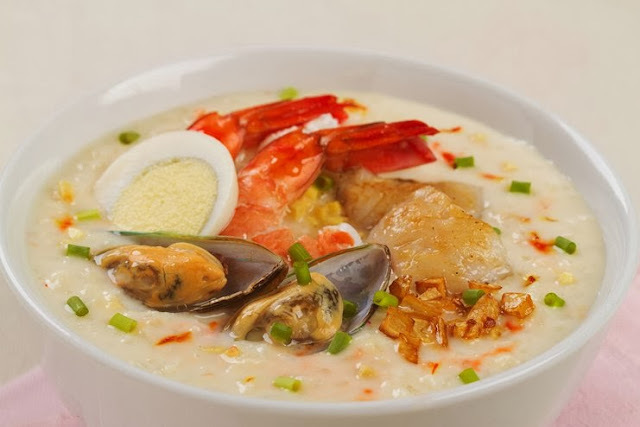 Arroz Caldo is a popular Filipino Congee. It has been a favorite Filipino snack and is best eaten with tokwat baboy. But this time we will try the sumptuos seafoods readily available in the market. Try this rich and decadent version of everyone's favorite comfort food. 1. Combine oil and garlic in a pot, toast garlic while mixing, over low heat until light golden brown. Immediately drain in a strainer and set aside for garnish. 2. Pour garlic oil in the same pot and ginger and onion and sauté ginger and onion for 2 minutes. 3. Add tahong, fish fillet and shrimp. Season with MAGGI MAGIC SARAP, gently stir, cover and cook for 2minutes over low heat. Remove tahong, fish and shrimp and set aside. 4. Add malagkit na bigas in the same pot and coat the rice with oil. 5. Add water and kasubha. Bring to a boil and lower down to simmer. Simmer for 30-40minutes or until rice completely cooked. Add coconut cream and season with MAGGI MAGIC SARAP. 6. Add pan steamed tahong, fish and shrimp. Cook for another 2minutes. Add sesame oil. Check seasoning. 7. Transfer into serving bowls and garnish with reserved toasted garlic, spring onion and egg.